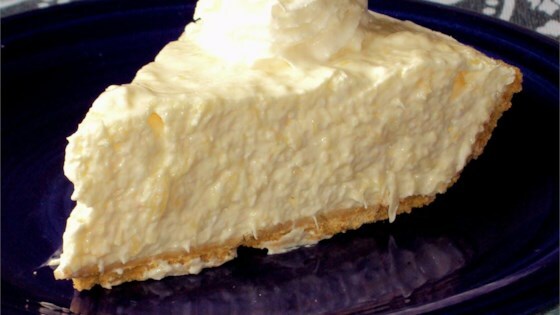 Recipe by: James R. Bray Sr.
"This no-bake pie tastes like a pineapple cheese cake. You can use any ready-to-serve pie crust in this recipe." Drain juice from pineapple. Set the fruit aside. Dissolve the gelatin in the pineapple juice, and microwave for 1 minute. Mix whipped topping and cream cheese until smooth. Mix pineapple into creamed cheese mixture. Stir in gelatin, and mix thoroughly. Pour into pie shell, and refrigerate for 4 to 5 hours. I dont know if i did something wrong, but the filling was enough for 2 pies! !the pie did taste like cheesecake.